Fall 2016 marked the first season for our Youth Ambassadors Crew at the Middle Rio Grande office. 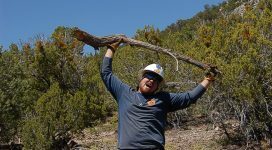 The mission of our ambassadors is to engage with their community and spread the word about Rocky Mountain Youth Corps, Valle de Oro National Wildlife Refuge, and the broader efforts of this partnership and its impacts on our region. The crew is a part-time cohort, comprised mostly of students in high school or college, whose schedule makes it challenging to maintain meaningful work outside of the summer season. Many have worked with us before, and were seeking a way to stay engaged after going back to school. It’s just over a month into their season and this crew already has some remarkable achievements. They helped kick off the 4th birthday of Valle de Oro at a widely attended event at the refuge, they have been present at various special events at venues like Explora!, they have formed a partnership with Ciudad Soil and Water District to provide ongoing educational workshops at local area schools, and they have even spent some time out in the field helping build trail during a service day at Rio Grande Del Norte National Monument. 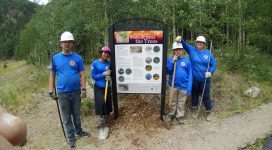 As their season continues, the youth ambassadors will be out in the community, representing Rocky Mountain Youth Corps and Valle de Oro National Wildlife Refuge. If you attend any community events in the Albuquerque area, look for blue shirts, and ask them about our program!